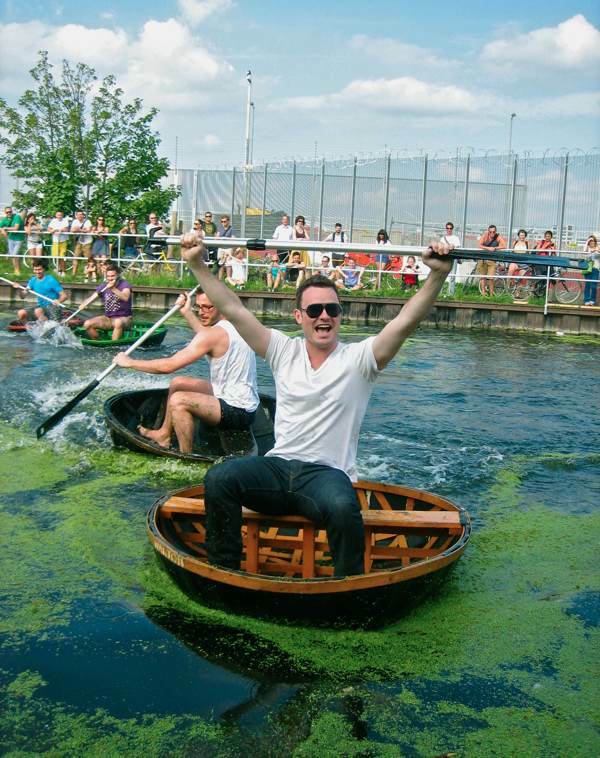 For the past six years, the last Sunday in July has seen the annual coracle race hosted by the Eton Mission Rowing Club on the cut of the River Lee in Hackney Wick, and at this year’s event there were more spectators and contestants than ever before. 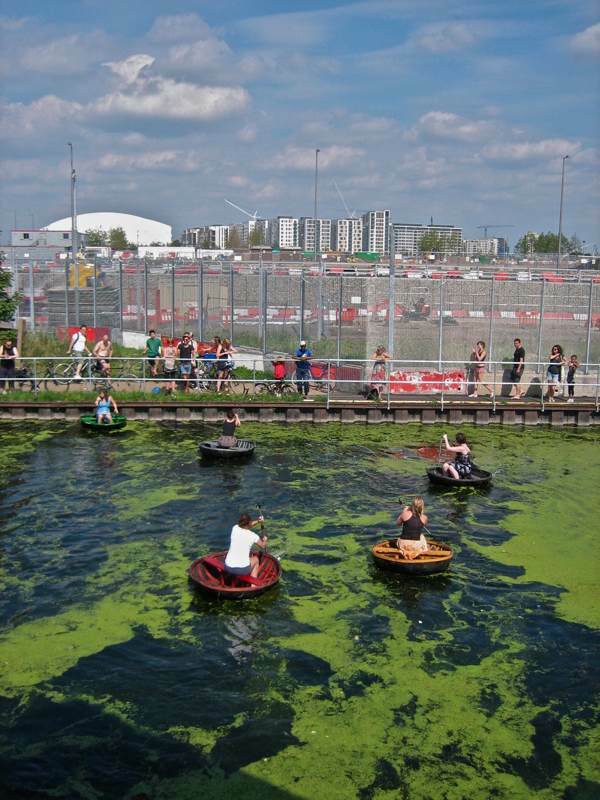 The youthful residents of Hackney Wick have embraced this annual contest with passion, queueing up expectantly to try their luck at manoeuvring these flimsy vessels from one side of the River Lee and back. It makes an extraordinary scene, with the venerable rowing club on one side of the river and the futuristic site of the 2012 Olympics bordered with razor wire on the other. The beauty of this race is that anyone can walk in and sign up and take part. You do not have to have any experience, you do not have to have any skill, you only have to have an eager nature and not be afraid of getting wet. And on this baking July afternoon, there was no shortage of plucky contestants, some in pretty flowery dresses, others in smart naval uniform, all valiantly stepping forward without a second thought, quite undaunted by the looming possibility of public humiliation. You might think that if St Brendan was able to paddle to America in his coracle, then a crossing of the River Lee might prove an inconsequential challenge, but you would be wrong. Once you have worked out which is the front and the back of these archaic craft – contrived from willow and canvas primed with tar – and climbed aboard, then you discover how tippy they are. 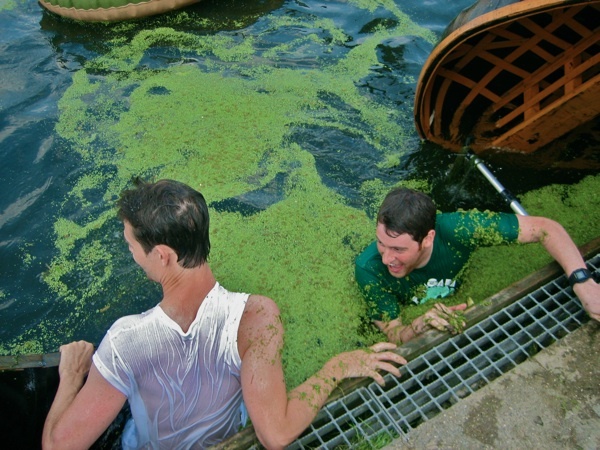 Some got into their coracles and capsized instantly, while others waited until they were in the middle of the river surrounded by duckweed to take the plunge. As you can imagine, it makes great spectator sport and spirits were riding high amongst the assembled throng crammed together on the riverbank in the July sunshine to witness a long afternoon of heats, culminating in men’s and women’s finals. 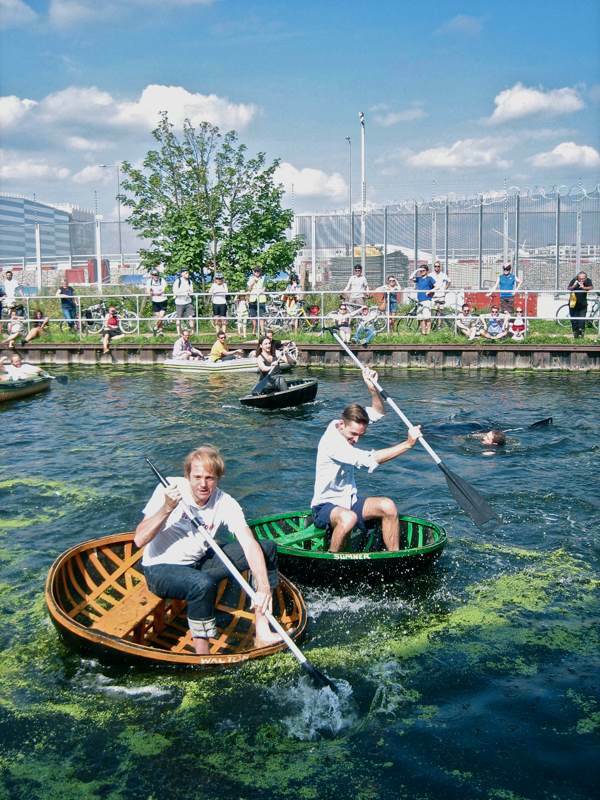 To commence the race, each coracle has to be touching the shore and when the commentator waves his flag the contestants push themselves off, paddling alternate strokes on either side of their coracles. With entrants of wildly varying abilities, there are those who can paddle the traditional figure of eight stroke and there are those who simply drift off down the river in the breeze. Yet the races are not without drama, since the boats often collide in the heat of the contest, and, when one person capsizes, sometimes they take a rival down with them too. 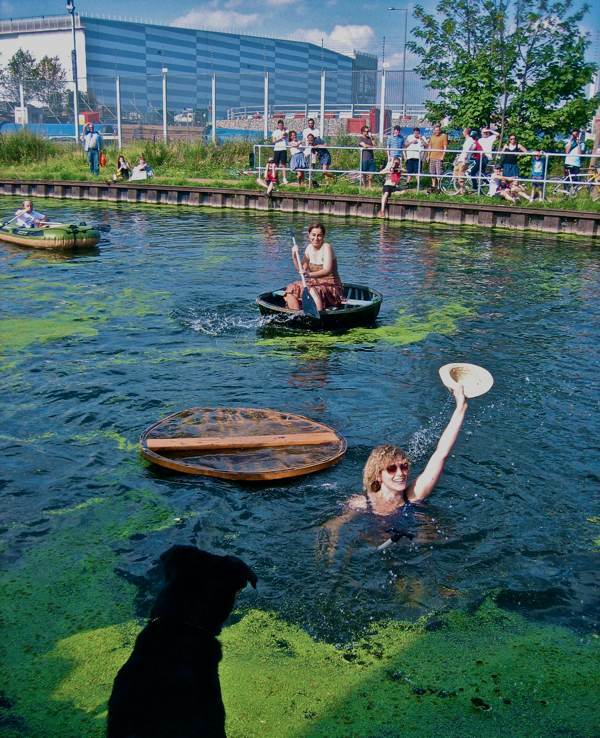 Emerging from the drink into the crowd like river gods, trailing duckweed and with water pouring from their pockets, these dripping heroes bring further misrule into the excited gathering. 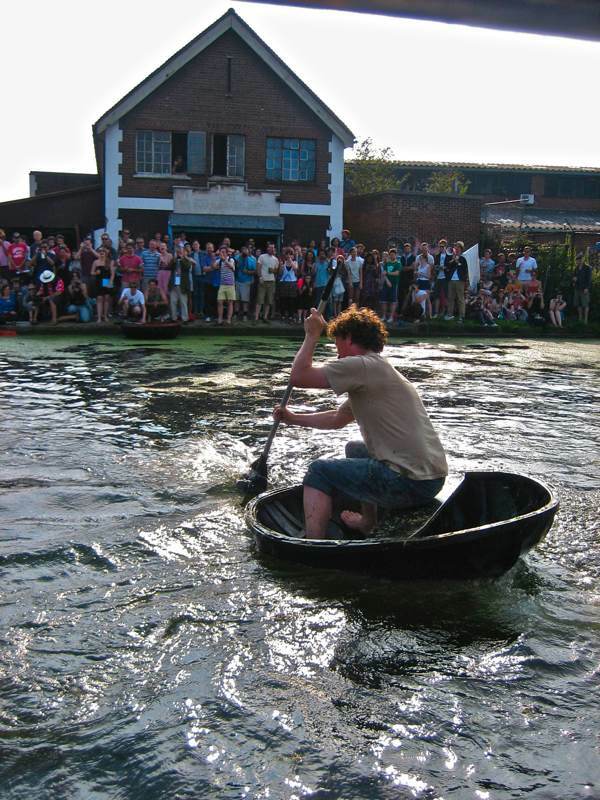 At the centre of the event, pacing the riverbank and helping contestants in and out of their coracles was Harry Meadows, an artist with a studio nearby. 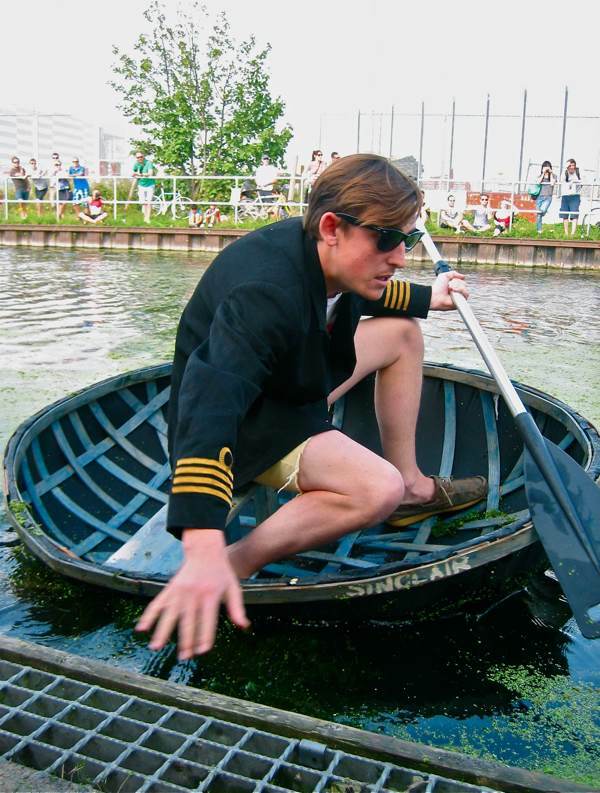 Harry grew up in Wales where the coracle is part of the national identity and he is the one who had the inspiration to start this glorious event, when the possibility of the Olympics was first mooted in East London. 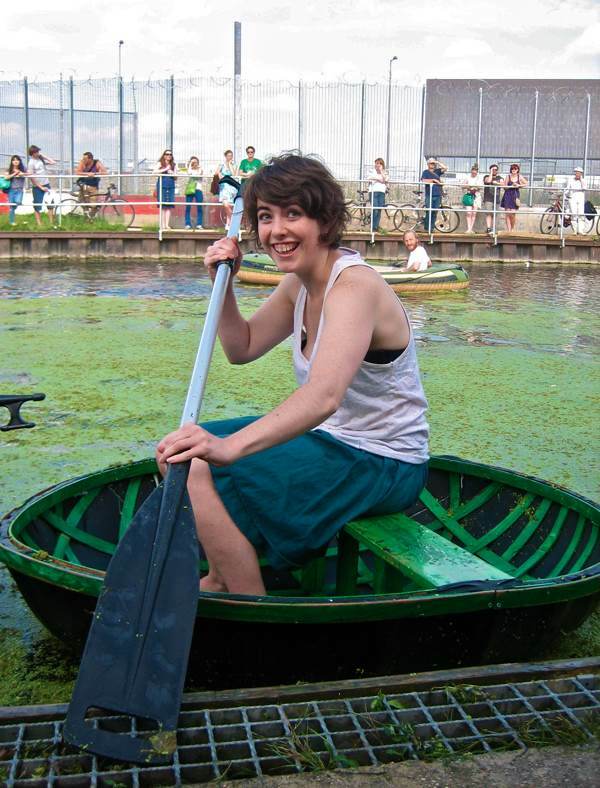 “Like many people in Hackney Wick, I went to the public consultations for the Olympics where we spoke and they didn’t listen – it was a ritual. So I realised we needed a different ritual of our own to serve as “beating the bounds” for the community that exists here.” he explained to me, his pale features flushed by the sun and the success of the afternoon, as we sat in the cool of the club house afterwards when the hordes had departed. 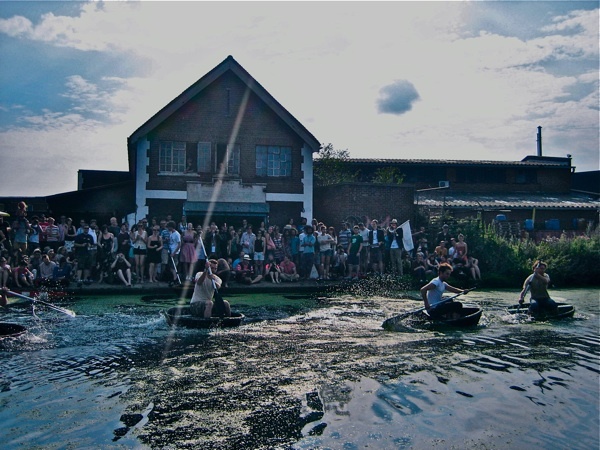 The coracle race is a spontaneous expression of the vibrant community in Hackney Wick today, and I was delighted to see so many young people celebrating at the Eton Mission Rowing Club. Where, in happy contrast to the apprehension I encountered on my previous visit, I found the senior members in good spirits. 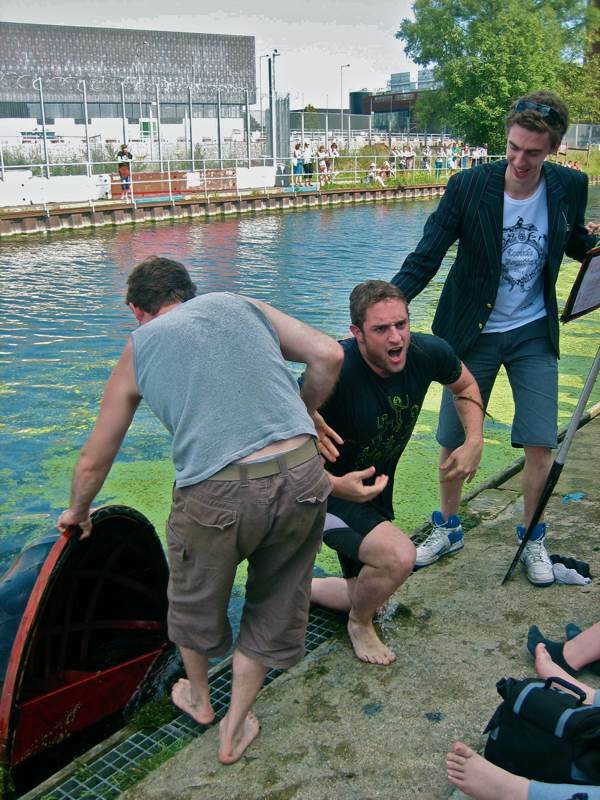 Yet it was not simply the coracle race that gave them such pleasure, it was the news that a hiccup on behalf of the Olympic authority has revealed they are in a stronger position than it appeared when I was last here a month ago. You will recall that the Olympic authority were preparing to take part of the Eton Mission Rowing Club’s site to build a bridge, which would make it very difficult for the club to function. Throughout this process, the authority was acting as if it had ownership of the land, but recent scrutiny of the legal documentation has revealed that they only have a licence to use of the land, whilst the rowing club retains the lease – so the Olympic authority will not only have to compensate the rowing club but give the land back afterwards too. Looking to the future, Club Secretary, Tim Hinchcliff, now intends to submit a planning application to build an extension to their clubhouse on the controversial piece of land – containing a changing room for women, which the club lacks at present. 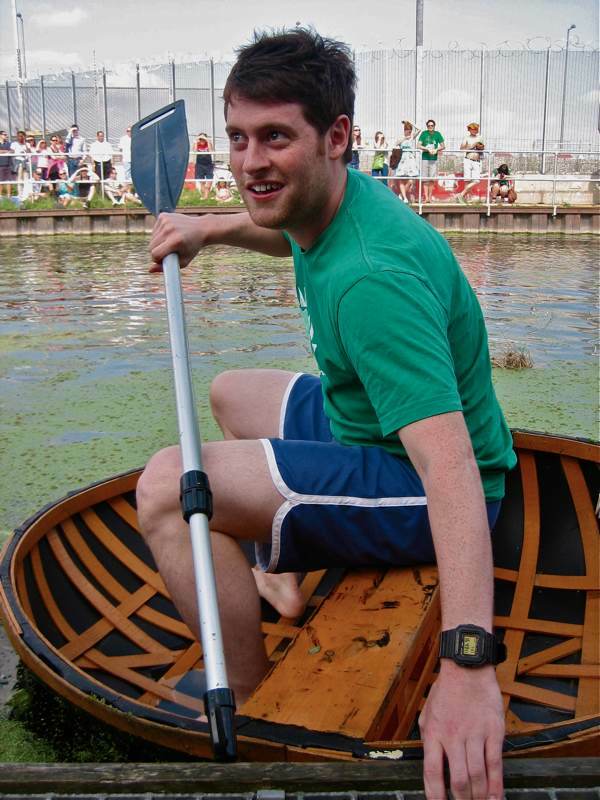 “We’ve won a small victory but not the battle yet,” he admitted, his sharp blue eyes glowing with determination, anticipating the tough negotiations that will be required to ensure the rowing club can get its land back after the games. 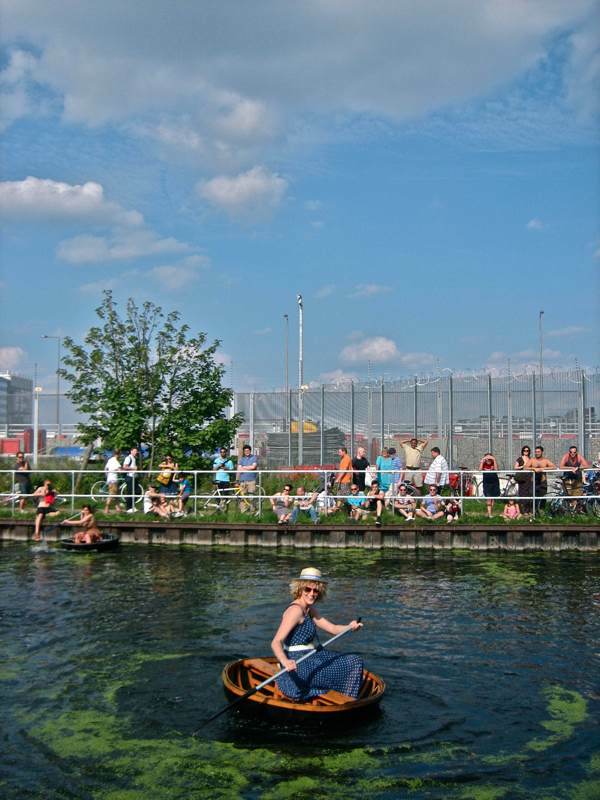 After such a joyous afternoon of high jinks on the river – an unexpected manifestation of how new and old East End have been brought together in Hackney Wick in the face of an external threat – I was delighted to learn that the future of the Eton Mission Rowing Club looks brighter than before, and I hope it means the annual coracle race on the River Lee may also now continue for many years to come. We were sorry to miss this – had to be elsewhere. 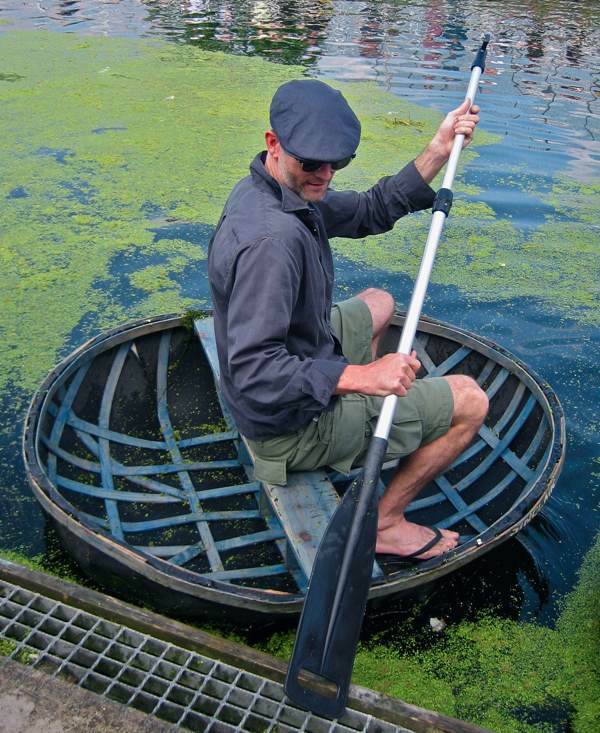 The coracle holds a very special place in my partner’s heart. Growing up in Shrewsbury he was a regular supporter of the local football team whose pitch was then located on the banks of the river Severn. Because balls often found themselves in the water, the ground employed a man to rescue them. He would sit in the crowd but at the sight of a ball heading out of the stadium would rush out, to the loud cries of the crowd, to jump in his coracle and rescue the ball. Unfortunately this long ritual came to an end when Shrewsbury Town relocated a few years back. 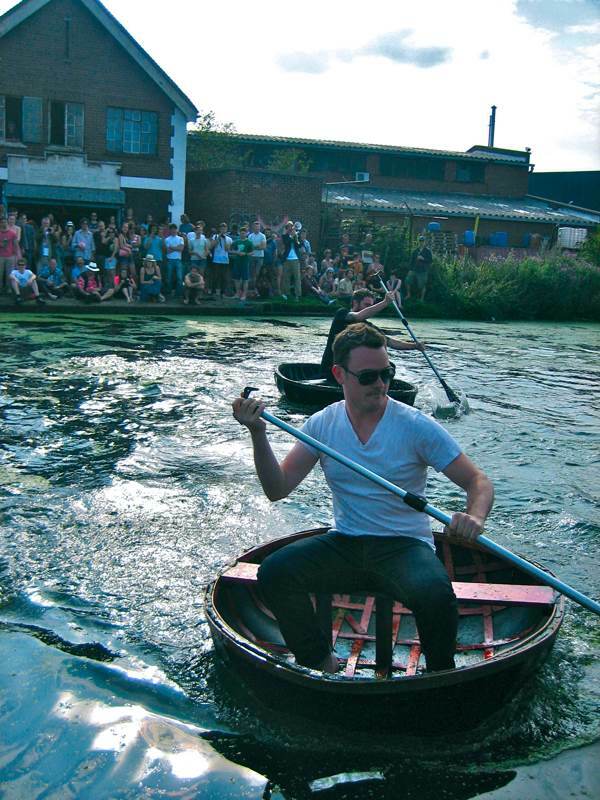 My kids would have loved to see their dad capsize a coracle! What fun this would be to witness, and to participate! Many thanks for your daily slice of life.